The Life Policy stamps of Great Britain are surely the most striking, and arguably the most attractive, of all the revenue stamps to have been issued there. Values of 6d, 1/-, 2/-, 2/6, 5/-, 10/-, and £1 were recess printed by Perkins, Bacon & Co. Sheets were of 18 stamps, three rows of six. Although the stamps were issued in the same month as the introduction of official perforation in Great Britain, the size of them was problematic and it was not until 1872 that they were first perforated. Until that date, all the stamps were issued imperforate. Stamps on the sides of the sheet were left imperforate during the perforating period. As a result a 3d stamp was issued, though a 1d stamp was not issued until 1870. 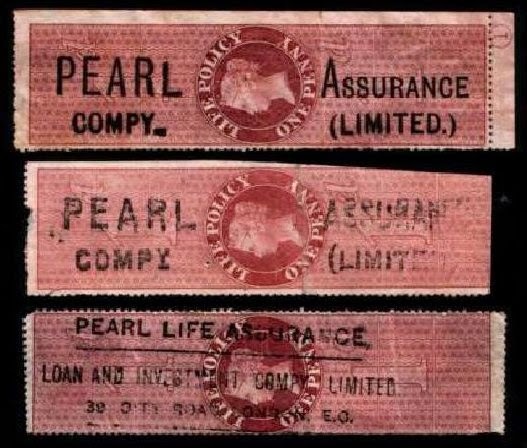 Life Policy stamps were withdrawn in 1881, though the tax remained in force for some time later, the duty being paid by embossed general duty adhesives. For the overprint collector Life Policy stamps present a real challenge. 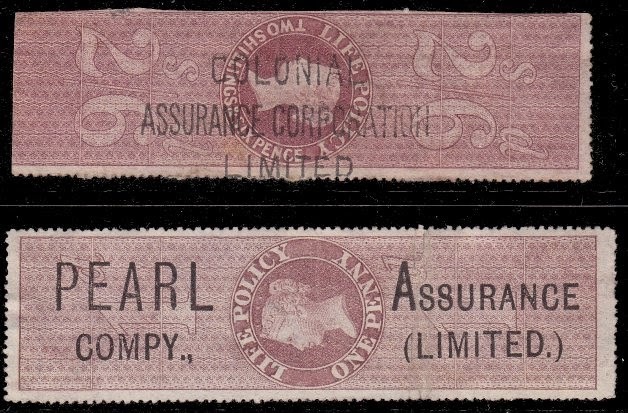 A few insurance companies are known to have overprinted these stamps but they are extremely scarce. I have only two in my own collection and the rest of the stamps shown here represent the sum total of overprinted Life Policy stamps that I have seen.